The Fern and Mossery: Can you tell this is a fake terrarium? Can you tell this is a fake terrarium? I'm excited to share this "faux" terrarium that looks quite lifelike. 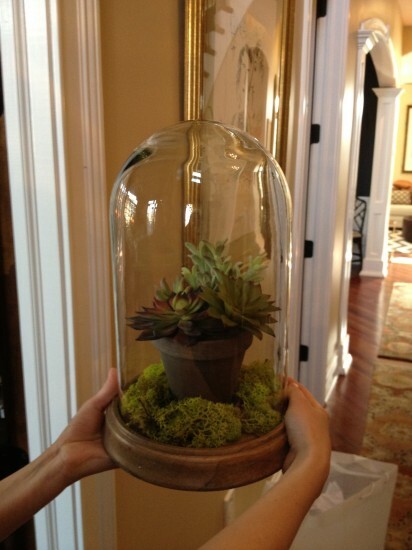 I spotted this beautiful cloche arrangement at kellyandolive.com. We've all seen the cutesy fake terraria sporting felted mushrooms and what not but - what do you think of realistic yet plastic plants? I, of course, love the process of watching living plants take over an enclosed space. But as Kelly and Olive point out - fake can have it's own merits. And it’s the perfect application for a fake plant. The room is a lovely, but low-lit library, and the plant was going to go on a bookshelf. The man of the house makes his headquarters in there, and he’s a busy guy, so it wasn’t likely that he would remember to care for the poor little thing. We needed something green, but sturdy. We needed beautiful, but unkillable.